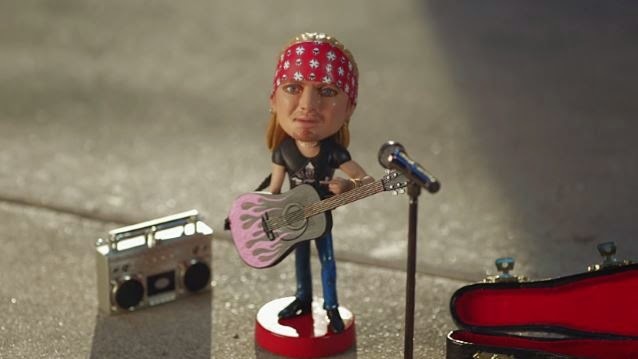 Bret Michaels and BobbleBret – a bobblehead version of the Poison singer – are featured in a new series of commercials for Nissan’s Tough Love campaign. It’s the latest promotional tie-in for Michaels, who covered Lionel Richie’s 1981 US chart-topper with Diana Ross, “Endless Love”, in a viral video for Nissan last year. Billed as “Tough Love”, the original ad campaign highlighted the durability and ruggedness of Nissan’s line of commercial vans. The 2015 video series sees Michaels and BobbleBret in variety of scenes under the Tough Love banner. Michaels is selling a limited edition run of BobbleBret dolls via his website. The singer recently issued a video for his new single, “Girls On Bars”, the lead track from his newly- released album, "True Grit." The project features guest appearances by Lynyrd Skynyrd’s Gary Rossington and Rickey Medlocke, Jimmy Buffett, Rascal Flatts and Loretta Lynn. Michaels is currently on the road across the US playing dates on his True Grit tour.